New challenge: Catholic secondary schools will compete against each other in the Catholic Secondary Schoolgirls’ Sports Association competition. FOURTEEN Catholic secondary schools are out to prove who has the strongest athletes in a new association combining competitions in nine sports and three interschool sports carnivals. 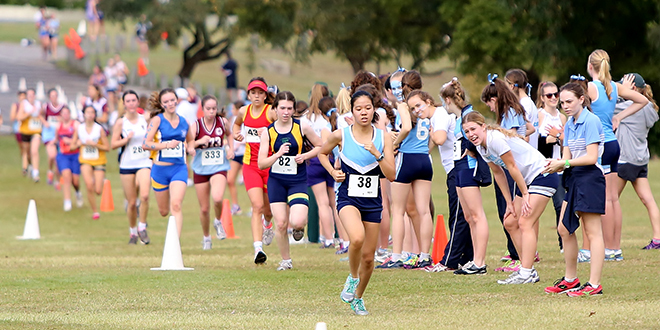 The Catholic Secondary Schoolgirls’ Sports Association competition combines the former Catholic schools’ tennis competition, Wednesday-afternoon sports competitions, and the interschool cross country, athletics and swimming carnivals. Schools participating in the new CaSSSA competition include All Hallows’ School; Brigidine College; Downlands College, Toowoomba; Loreto College; Lourdes Hill College; Mary MacKillop College; Mt Alvernia College; Mt St Michael’s College; Our Lady’s College; San Sisto College; St John Fisher College; St Mary’s College, Ipswich; St Rita’s College and Stuartholme School. More than 300 girls from 10 schools are competing in the Saturday tennis competition, with finals occurring in May at the Queensland Tennis Centre. More than 1000 girls from all participating schools are competing across eight sports. The interschool carnivals for swimming, athletics and cross country will be split into two competitions based on school population. The larger schools – All Hallows’ School, Brigidine, Loreto, Lourdes Hill, Mt Alvernia, Mt St Michael’s, St Mary’s Ipswich, St Rita’s College and Stuartholme School will compete for the CaSSSA Cup. Downlands College, Mary MacKillop College, Our Lady’s College, San Sisto College and St John Fisher College will compete for the CaSSSA Shield. These interschool carnivals will run three times a year to give a larger number of students an opportunity to compete. All Hallows’ School principal and CaSSSA board chair Dr Lee-Anne Perry said schoolgirls participating in the competition would build a sense of community and connections with others who are passionate about sport.